Summer is approaching and the Green Market moved back outdoors last week. That means lots of asparagus, rhubarb and spinach right now. Sometimes I will blanch the asparagus as soon as I get it home. I'll cook it for a scant two to three minutes so it's ready if I want to make something on the fly. 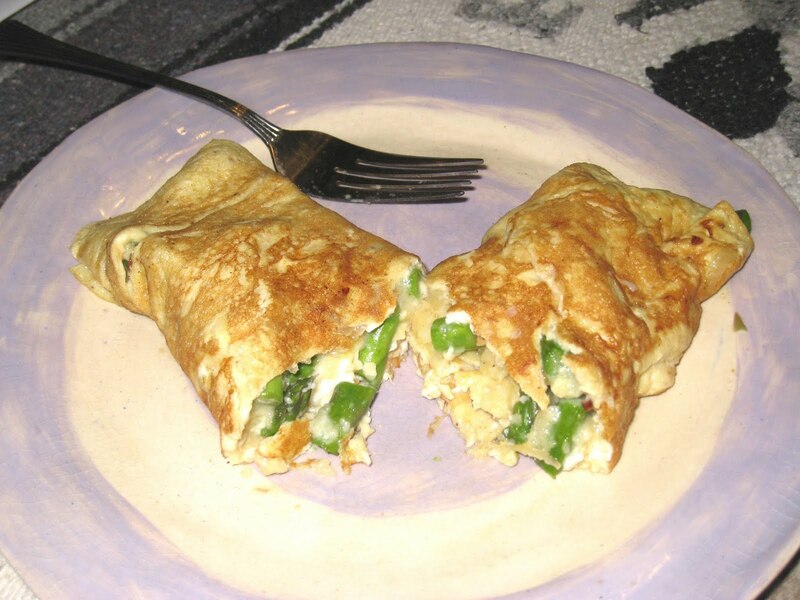 Like this asparagus and piave cheese omelette. I needed a quick breakfast, and I had eggs, the asparagus all ready to go, and some grated piave, of which up until a few months ago I had never heard. I was at the Lincoln Park Zoo Whole Foods waiting for the rest of my knitting group to arrive and I was wandering around the cheese section. I love to browse through there as much to see what interesting new cheese I can find as to see how long it takes for one of the two (sometimes more) hip young cheesemongers to acknowledge me. Ha ha, I am only joking - they never acknowledge me! But they do occasionally have samples of cheese, which I am eager to taste. I don't know a lot about cheese, but I want to know more and I am always on the lookout to try new kinds. And one night I tried something that was quite tasty and I thought about buying some but decided to wait until the next week. And then promptly forgot what it was. I knew it started with a "P" and tasted like a milder, younger, creamier parmigiano reggiano but that was all I could remember. I knew I would recognize it if I saw it again, though, so I checked every week to see if I could find it, but they never had it on display again and there are too many cheeses there for it to be practical to search cheese by cheese. A few weeks ago I got lucky. It was on sale so there was a bigger sign than usual. Piave Cheese. I snatched some up and brought it home with me. It was quite good on pasta and pizzas, and it disappeared quickly, except for a last little bit that I had pre-grated that wasn't really enough for a meal. But it was the perfect amount for an omelette yesterday morning. I am pleased with how my omelettes are turning out these days. I still follow my basic technique, but I am better at sticking to my less-is-more theory and not filling them so full that they fall apart when I try to plate them. I had half a shallot in the refrigerator that I chopped and sauteed with a little butter. I beat two eggs with a splash of water (and yes, a scant teaspoon of Worcestershire sauce - you don't want to use too much because it can give your omelette a brownish tinge that is most unattractive) and salt and pepper to taste and added them to the pan. When the eggs were just about set, I laid the asparagus and cheese over the middle, then folded over one side and let it sit for a minute or so. Then I grabbed the handle of the pan and slid the omelette onto the plate, turning it so that the third side folded over the already-folded part. A delicious breakfast, to be sure. i like omelet in breakfast with bread.